Exercising in the postpartum period is a way to help you get back into shape and stay healthy for your baby and yourself. Many moms want to know when they can start exercising after giving birth. The general advice from physicians and midwives is to wait six to eight weeks before really getting into a fitness routine. You may be asked to wait longer or hold back a bit if you have had a cesarean section or an operative vaginal delivery (with forceps or vacuum extraction). Your doctor or midwife can give you specifics on your personal timeline for exercise. Ideally, this bar on strenuous fitness will not hamper your efforts to move. Movement is perfect and should begin within hours after you give birth, even if you required surgery. We know that moms who move after birth do tend to heal more quickly and feel better sooner than their less active counterparts. This doesn't mean jog around the block, but it does mean getting up and moving around your hospital room or in your home. Even after a c-section or after an epidural, you can begin to walk with assistance in just a few hours. Though the first few attempts may be painful, overall, the movement is good. I do not recommend a fitness routine, but a daily brief walk after the first week or two is perfect. Watch for overdoing it, which is not hard to do early on. A good way to tell if you are doing too much is if your bleeding gets heavier or brighter red within a few hours of moving. Postpartum bleeding after exercise shouldn't change too much. If it does, you're overdoing it. If you were exercising prior to pregnancy, you may feel more of a need to get out and get going. On a limited basis, some practitioners will give you the go-ahead. You might be asked to do modified yoga versus aerobics, but stretching and gentle movements are fine. 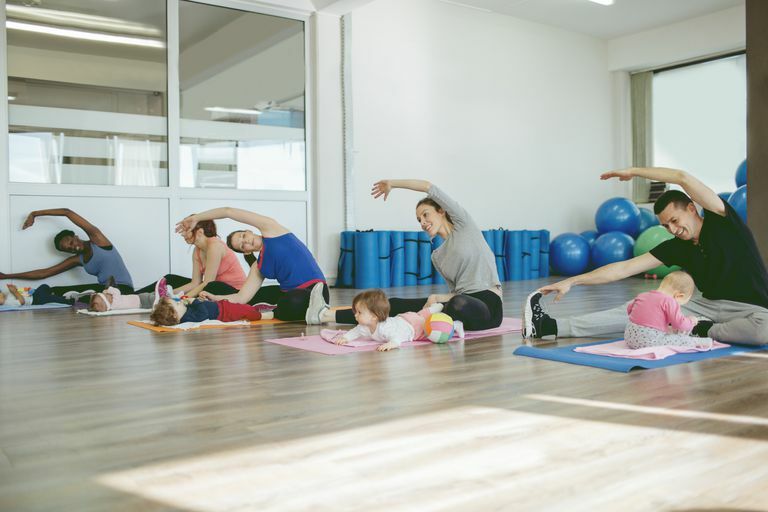 Once you are healed and ready to begin a regular postpartum workout routine, you might consider doing something like this workout routine for new moms. Remember that your body is still adjusting to its non-pregnant state. You will have your center of balance shifting again, the hormones of pregnancy will continue to make your joints a bit softer and then you have just the feeling of exhaustion that can accompany any birth. This means that even when you have the energy, you may be a bit more prone to injury for a while. Go slowly and be gentle with yourself during this time. When Can I Start Exercising After Having a Miscarriage?